The D&J Harmon Company of Bakersfield, California pioneered the technology of on site generation of sulfurous acid for agriculture in the 1950’s; John Harmon continues the manufacturing process there today. The Harmon Systems International sulfurous acid generator, aka sulfur burner, always has been and continues to be the leader in the industry. The Harmon Systems international generator is reliable and durable with examples of 40 year old machines still in use in the central valley of California. Treating your irrigation water with H2so3 provides an ideal PH which in turn helps to leach the salts in the soil. This will provide a way for turf to grow in a more natural environment; the way nature intended it to. It reduces the amount of water needed while producing a healthier product. This is a safe organically certified process that will save you time, resources and fit into any golf course maintenance budget. 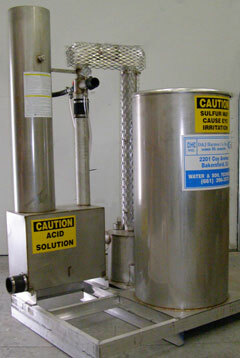 Why Should I have a Sulfurous Acid Generator at my course? On site sulfurous acid produced by the Harmon So2 Generator treats problems associated with soils affected by salts and alkalinity. The Harmon So2 Generator provides an aqueous solution with a certified organic process. Controlling alkalinity through this process enables plants to thrive under less stress, increasing oxygen and water penetration. Thriving plants are less susceptible to disease, require less fertilizer and cultivation.